Flonase (generic name: fluticasone) is a medication used to manage symptoms of seasonal and perennial (continual) allergies. It belongs to a category of medicines called corticosteroids and reduces such symptoms as nasal congestion, runny nose and sneezing. According to MedlinePlus, Flonase is available as a nasal spray that must be applied to each nostril one to two times daily. 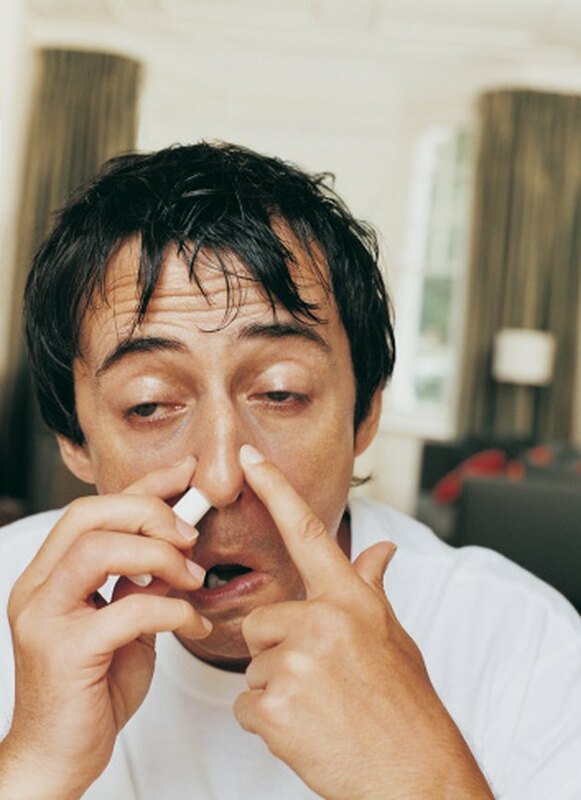 In seven controlled clinical trials in the United States composed of 536 patients with seasonal or perennial allergies receiving 200mcg of Flonase, the National Library of Medicine reports that 16.1 percent of patients developed a headache, 7.8 percent developed pharyngitis (sore throat), 6.9 percent developed epistaxis (nose bleeds), 3.2 percent experienced nasal irritation and 2.6 percent developed nausea and vomiting. In this same study, 3.3 percent developed such asthmatic symptoms as wheezing and difficulty breathing, while 3.8 percent developed a cough. MedlinePlus says that stomach discomfort, diarrhea and dizziness are other common side effects. Tell your doctor if these symptoms continue. According to MedlinePlus, Flonase can cause severe side effects such as hives, rashes, difficulty breathing, muscle weakness and extreme fatigue. It can also cause acne, white patches in your mouth or throat, problems seeing and swelling of your extremities, face, tongue, lips and throat. Flonase can also cause changes in your menstrual periods, hoarseness and difficulty swallowing. Additionally, it can lead to persistent nasal sores, fevers, body aches and chills. Visit your doctor or get medical help if you experience any of these severe side effects. Avoid using ritonovir (an antiviral medication) with Flonase. According to the National Library of Medicine, this combination can lead to increased Flonase levels and this may result in such conditions as Cushing syndrome and adrenal suppression. Cushing syndrome is a condition of increased cortisol exposure. Symptoms of Cushing syndrome include fatigue, high blood sugar levels, high blood pressure and anxiety. Adrenal suppression refers to a decrease in adrenaline hormones and may lead to weight loss, low sugar levels (hypoglycemia), nausea and vomiting. MedlinePlus warns that you should tell your doctor about the medications, vitamins, herbs and supplements you are taking. Medications such as fluconazole, cimetidine and oral contraceptives can make Flonase less effective or may instigate the aforementioned side effects. Flonase can stunt your child's growth. Talk to your doctor prior to allowing your child to use Flonase.